Arrive and check into private home or condo: First thing’s first – check into your home for the week. We recommend staying in one of the premier chalets or private homes at The Lodge at Vail. If you’re a tad early, don’t worry. You can store your luggage at The Lodge at Vail’s front desk while you begin checking off some of the fun things on your To-Do list. Grab your rentals and make sure you have lift access: When you reserve your rentals ahead of time, we will deliver them to your hotel for you. Make sure they have arrived, and then either take them over to the Lodge’s complimentary ski valet to store for the night, or head straight for the mountain. We recommend buying your lift tickets in advance of your trip so that they can be mailed to your doorstep, but you can also purchase online or in-person when you arrive. Get on the mountain: If you took a morning flight, maximize your time here and get on the slopes! The front side of the mountain offers a variety of terrain with something for every member of your family. Start by taking Eagle Bahn Gondola to Eagle’s Nest and cruise down Cub’s Way with the kids to kick off a sure-to-be epic week. Explore Vail Village Now it’s time to venture into the Village. Explore dozens of shops while strolling along Vail’s heated cobblestone streets and taking in gorgeous views under the sunny springtime skies. Be sure to stop by family favorites Gorsuch, Kidsport and Tessa Clogs. Dinner on the mountain Hop onto Eagle Bahn Gondola before sunset and take in the Sawatch Range on your way up to Bistro Fourteen. With delicious menu options for the whole family and unmatched views, it’s the perfect way to kick off your vacation. Morning family ski and half-day lessons: Round up the troops and get ready for an exciting day on the slopes. Spend the morning skiing together, then divide and conquer after lunch. Mom is headed to her own all-female ski lesson, while the kids join a group lesson to make some ski buddies – giving Dad plenty of time to fit in his favorite double-blacks and tree runs. 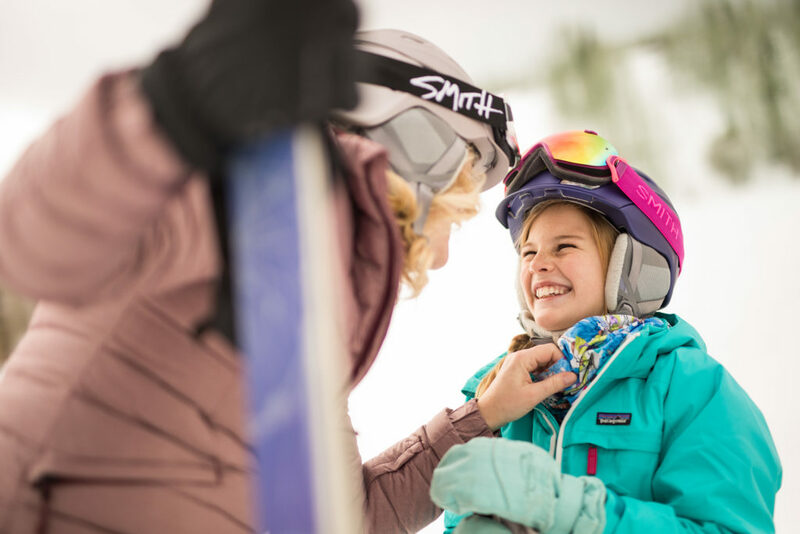 The whole family can track their vertical feet with the EpicMix App throughout the week and earn badges as you make your way around the mountain. Lunch on the mountain: Before heading to your respective lessons, take a break to enjoy lunch on the mountain at Two Elk or Wildwood Smokehouse. Two Elk serves up their famous buffalo chili near China Bowl and Blue Sky Basin, while Wildwood specializes in authentic, award-winning BBQ two miles high. Plus, you can enjoy these good eats on the deck to soak up some more of the sun. Family-friendly Après at The Four Seasons Kids can sip on the award-winning “haute chocolate” while adults imbibe one of The Remedy’s “Daily Prescriptions” or “Elixirs” at this Four Seasons après spot. Pizza night in Vail: It’s a pizza kind of night. You can stay at your après spot, The Remedy, for their renowned Bison Pizza among other delicious options. Blue Moose is also a popular choice for families, with paper tablecloths as a canvas for kids’ creative coloring and, of course, its signature New York-style pizza. Morning ski: After being shown the ropes by one of Vail’s ski guides, it’s time to explore on your own. Spend the morning confidently discovering different parts of the mountain with your crew. Use our beginner, intermediate and expert trail guides to help you craft a game plan before getting on the slopes. Lunch in Vail: Stop by Blü Cow Café to devour one of their famous Swiss Hot Dogs and a hearty homemade cup of soup. This family-owned spot has been serving their delicious dogs since 1967. Afternoon snowmobile trip: Take the kids up to Adventure Ridge in the afternoon for a special snowmobile trip designed for children ages 6-12 years old. Have your camera ready to take some action shots as they zoom around the park on our specially crafted mini-snowmobiles. Dinner and bowling at Bol in Vail This isn’t your average bowling alley. Bol boasts 10 lanes and tasty menu items ranging from octopus to duck buns to pizza and burgers. The adults can enjoy a beverage at their sixty-foot bar while the kids get their groove on with regular DJs. Breakfast in town: Fuel up the family before getting back on the slopes! Westside Café offers a large variety of breakfast fare, including “The World’s Best Benes,” lighter options and Mexican dishes as well. Adventure Ridge: Depending on how the family is feeling, opt for a half-day of skiing and then visit Adventure Ridge. There, you can try out other exhilarating on-mountain activities like snow tubing and ski biking with the whole family. Shopping in Vail Village: You can’t leave Vail without getting a special souvenir! For the women in your family, The Golden Bear is a Vail gem, and its signature bear design is considered “The Symbol of Vail Valley.” Vail Sports has a great selection of on- and off-mountain clothing for the family to choose from at multiple locations. Dinner in Vail: Catch dinner and a movie at the same time at CineBistro in downtown Vail. Reserve your seats ahead of time and arrive early for full-service dining. You can also opt for an interactive dining experience at Swiss Chalet, a family-friendly fondue restaurant in town. Hot tub time: Now that your bellies are full, let the body and mind relax in your vacation home’s hot tub and reflect on another memorable day in Vail. Full-day ski: By now you’re practically a powder pro! Make the most of your final day on the slopes by exploring parts of the mountain you haven’t seen yet. You can always utilize our handy trail maps to make a game plan and navigate the mountain effortlessly. Keep chasing the sun around the mountain to maximize the best snow conditions. Family-friendly après: Raise a glass to your last day on the mountain at either The Red Lion or Vendetta’s. The whole family will love the live entertainment at The Red Lion, or schmoozing with Vail’s ski patrol at Vendetta’s. Dinner at “home”: It’s been pretty go-go-go this week, so take tonight to wind down over a nice homecooked meal (wink, wink – room service will delight the kids) while reminiscing on the week’s activities. Ice-skating in Vail: Squeeze in some final family bonding time with ice-skating in downtown Vail. Take a spin around the beautiful Alderhof Ice Rink in the heart of Vail Square near the Arrabelle, taking in the stunning evening scenery one last time.